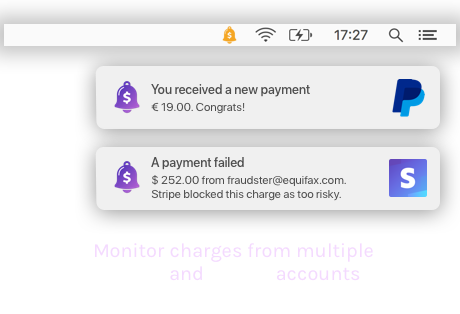 Monitor your Stripe and Paypal accounts from your menubar. CashNotify is designed for entrepreneurs who earn their living online: founders, freelancers, bootstrappers, consultants, digital nomads — any small business that gets money via Stripe or PayPal. 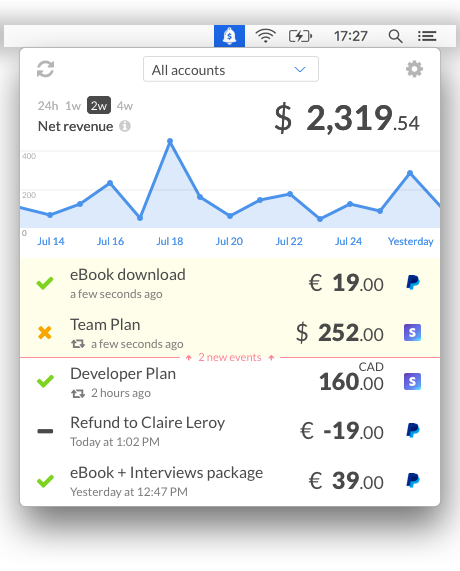 If you value your time and money, and can not spend your day in Stripe or PayPal’s dashboard, then it’s been designed for you. Install and forget. CashNotify lives in your menubar, so that’s one less icon in your Dock. And it starts automatically, so you can forget about it. 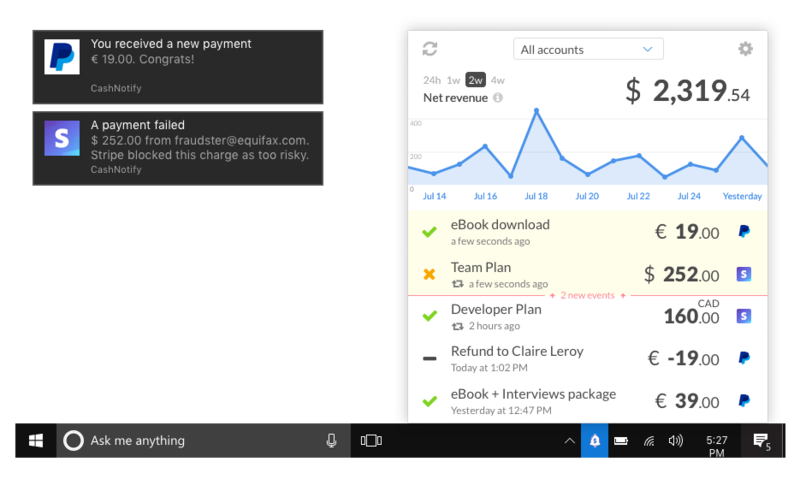 Receive alerts for successful and failed charges in your Notification Center. CashNotify always runs in the background, so you don’t miss anything. Decide which type of events you want to track and get notifications for. It includes captured payments, failed payments, refunds, payouts and subscription changes. 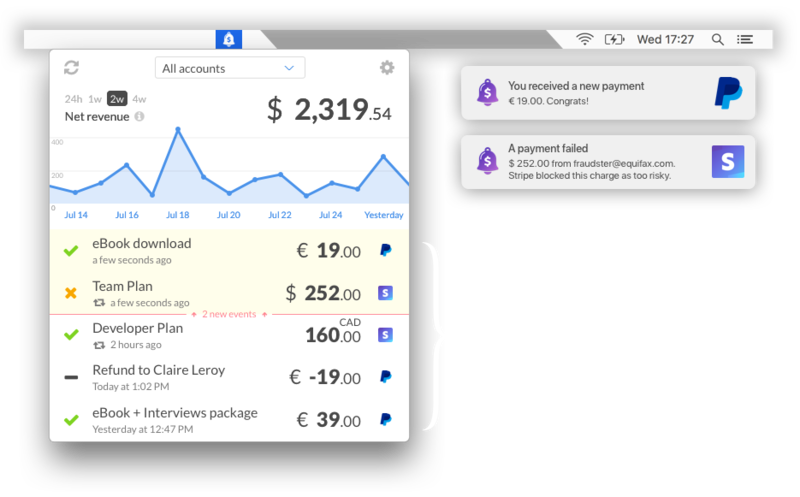 Click on an event to reveal your customer’s details and the fees for this transaction. 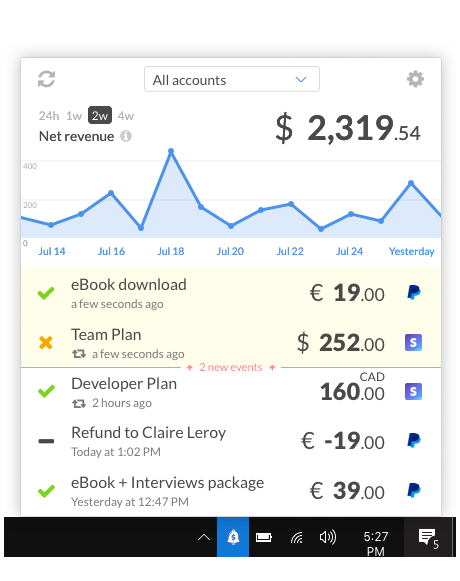 Add multiple Stripe and PayPal accounts to see their revenue combined on the app’s dashboard. 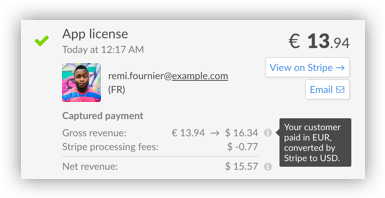 Data comes straight from Stripe/PayPal to your desktop. No intermediate server is involved. Your API keys are encrypted in your local keychain. Your API keys are the only thing required to get CashNotify running. None of your financial data ever reaches us. 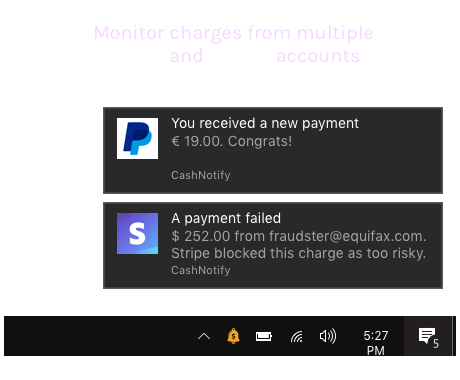 Everything happens between your computer and Stripe or PayPal servers, with no intermediate server involved. 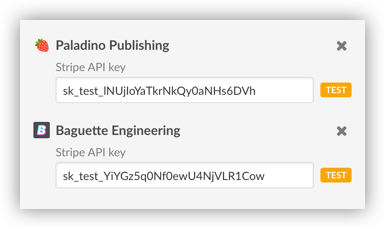 Your API keys are saved on your computer, encrypted in your local Keychain. 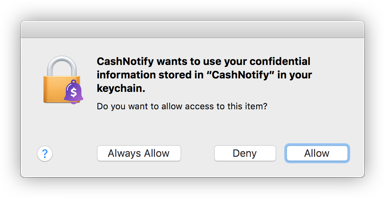 Read why CashNotify is secure. You can use Stripe or PayPal checkouts directly, or use it as a payment gateway for compatible e-commerce and shopping cart services. As long as you get your money through Stripe or PayPal, CashNotify will work.